A filter is the Heart of an Aquarium. Confused with which is the right canister filter for you? Our team of experts has reviewed the best canister filters, and here their recommendations. 4.1 How to choose a Canister Filter? Want the best equipment out there for carefree fish keeping? This is the filter for you!!! It’s smart, with modern design and comes microprocessors that monitors the temperature, flow rate and water parameters. You have an all-in-one system that just works great. Tried and tested over the years, Eheim’s exceptional work in aquarium products brings you the Classic Eheim External Canister filter. 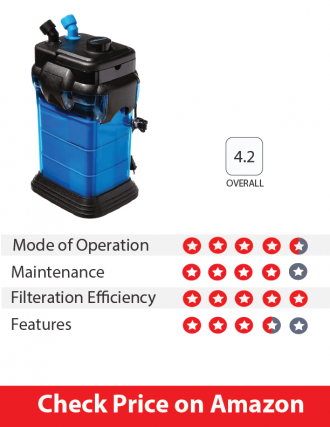 The Classic Eheim External Canister filter is brilliant and Outlasting most of the competitors. This filter works like a pro and lets you enjoy your hobby. In the review process, our experts tried and tested over 50+ canister filters and picked the best amongst them. They have selected the winners after judging the canister filters on various parameters like mode of operations, filtration efficiency and more. And here are the 5 Best Canister Filters. 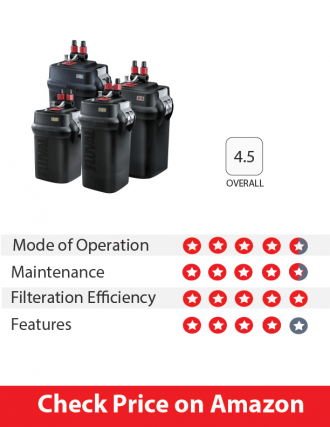 Best Canister Filter – This is the ultimate filter that you could own. It has everything. The quality of the parts is impeccable. Long-lasting, high-quality parts that can be assembled fairly simply. This beast works silently and will not make any noises. The filtered water quality is impeccable making it the Best Canister Filter. The internal thermometer is accurate, so no need for sticking in a thermometer in your aquarium because it works marvelously. The Fluval G Series comes with a Flow Monitor built in that flashes the rate constantly. Which is coupled with water parameters, so you could constantly monitor your tanks health. Filter maintenance is a breeze as you are alerted when to do so. Maintenance is quite easy with a single lever allowing the entire assembly to be cleaned without actually taking out the hosing. The media range is phenomenal and comes with a ‘Tri-Ex’ Cartridge that includes a nitrate, phosphate and carbon filter. Other media include a Phosphate Cartridge, a Nitrate Cartridge, Fluval’s Biological filter media etc. Thus have options for Mechanical, Chemical, and Bio Filtration media. Fluval G3 40-80 US Gal. For in styles for up to 40 US Gal. 66 US Gal. and 92 US gal. You cannot go wrong with this one. Eheim is one of the pioneers and has been in the market for more than a decade. Rather this is the ‘Most trusted filter‘ you could opt for, and we can safely say this as this beast is Millionfold tried and tested by fish enthusiasts across the globe. It is an easy-to-use filter with a simple assembly, however maybe a little tough for novices to set up because the instructions might not convey the best. But that’s something you can clearly overcome with tons of videos on “how to set up a canister filter” for setting up this brilliant, trustworthy equipment. 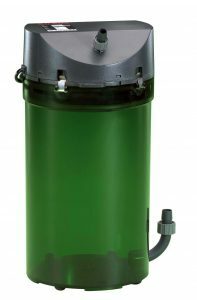 EHEIM Classic Canister External comes with all the basic features that one would expect from a Canister Filter. The filter comes packed with some relatively low power consumption electronics, starting from 5 watts for the EHEIM 150 to 65 watts for the 1500XL model. While running the filter operates rather quietly, only audible sound, is the sound of water from spray bar depending upon the placement. EHEIM Substrat Pro a large surface area Bio-media and EHEIM Mech, as well as a sponge, a Carbon filter floss and a polishing pad, are included in the Media packaging. You could use other EHEIM media as per your tank’s needs. This product is robust and durable and will outlast most of the competition. Overall a great filter at a great price and it makes our ‘Best Buy‘ Aquarium Filter with a low pricing and brilliant value. Excellent Filtration and Reliable Brand. Fluval is one of the Top brands for aquarium products, which includes Filters. The canister filters by Fluval are always exceptional and the quality of this filter is very noticeable even though its pricing is lesser than others. With no compromise on the quality of the parts, this filter works great. Fluval has made enhancements to the motor hydraulic performance which in increasing the head pressure, increases flow rates. 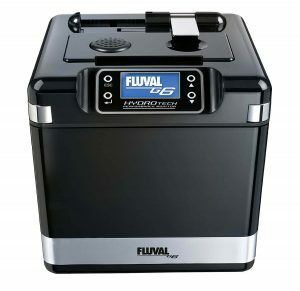 Undoubtedly Fluval Canister filters are quiet, but the Fluval 06 filters come with a Sound-dampening impeller design which helps in 8 to 15% quieter operation. Fluval 06 filter comes with a Stronger lift-lock and Aqua-Stop valves for easy installation and improved security. Setting up the filter and Maintenance of the filter is very easy, and it comes with a manual to guide you through. The instruction manual is very descriptive and overall very helpful with the setup and maintenance of the filter. In addition to that, we found priming much easier with the Fluval 06 filter, with the re-engineered priming system. 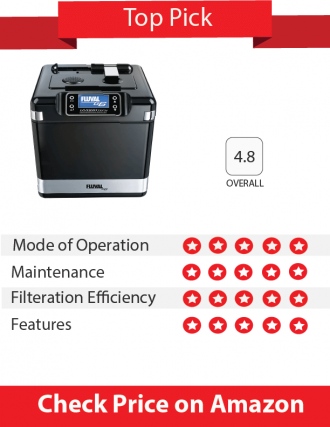 In our review, the filter was up-and-running within seconds of switching it on. But can be replaced with any Fluval Media available depending upon your tank’s requirements. 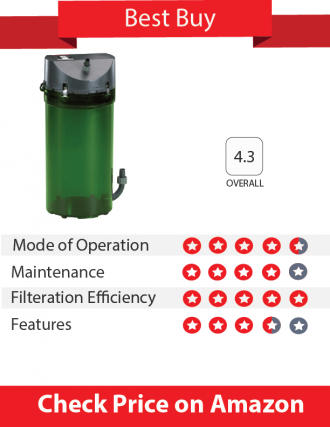 You could read a detailed review on Fluval 406 External Canister Filter by our experts over here. Also, check out Fluval FX series (FX4 and FX6) reviews. Although Hydor being new to the market, the product lineup doesn’t fall short of the competition. Made with Quality material to last the filter works great, you’ll not be disappointed. The best part of this filter is the fact that it’s the easiest to set up for professionals and beginners alike. Hydor Professional External Canister comes with a nice packaging with setup instructions and recommendations on the box as well in the manual inside. This filter is made of sturdy, reliable parts that make this a workhorse. The motor is well insulated and makes absolutely no sounds whatsoever. The impeller is on a ceramic shaft which increases the life of the motor. One feature we liked about the filter is that it comes with a solid hose as well the rotating hose attachment. The layout and size of the filter media baskets are amazing and gives enough room to add all that you want to make your filter your own. Comes with all filter media except for Carbon which you can buy easily. Efficiency is optimal and will have your aquarium water crystal clear in a matter of hours. The Penn Plax Cascade Canister Filters are the cheapest filter available in the market and one of the easiest filters to setup. You’ll have it up-and-running without any problems at all. Once that is done this filter works just great. With a pushbutton priming, it is very easy to prime the filter. The Penn Plax Cascade has ergonomically designed baskets for easy removal and a well-built body. Flow rate shut-off valves adjust water flow and make it easy for maintenance. The filter has a very good base and the body is translucent which acts can act as an indicator for maintenance (Looking at the water inside). Penn Plax Cascade Floss pads and Bio Sponges are easily available filter media. The large filter trays mean you can use more media and have longer time periods between replacement. Apart from the very low humming sound, the filter operation is quiet and the flow rate is brilliant so whether you have monster fish, goldfish or turtles this filter will do its thing. Cascade 500 up to 30 US Gal. Cascade 700 up to 65 US Gal. Cascade 1000 up to 100 US Gal. Cascade 1200 up to 150 US Gal. Cascade 1500 Up to 200 US Gal. As mentioned above an aquarium accumulates waste and debris over time which needs to be cleaned. A canister filter takes in the water from aquarium tank, media in the canister then filters it and sends it back to the aquarium. Unfiltered water is drawn from the aquarium through the inlet piping, straining the large debris through input strainer. Water then enters the filter and sent directly to the bottom of the filter in most of the filters. The water is drawn up using the motor from the bottom of the canister and it passes through various layers filtration media. The filtration media is usually a combination of Mechanical, Chemical, and Biological Media. Media is selected as per the requirements of the tank i.e. the type of flora and fauna and the kind of waste it generated. Media Includes– Meshes, Nets, etc. Bacteria need a substrate to proliferate on and, in the filter ‘Sponges’ and other Media are used for the same. Media includes– Seachem Matrix™, Bio Balls, Bio-Glass, Bio-foam, etc. Chemical Filtration: Using chemical media attracts pollutants like copper, chlorine, dissolved proteins, medications, or tap water impurities and traps them inside. As a result, the filtered water is free of chemical impurities harmful for aquatic life in your aquarium. Finally filtered and polished water is then sent back to the aquarium through the outlet pipes. You could either directly let the water in or use a spray bar. How to choose a Canister Filter? First of all, you’ve got to determine the filter based on the type of aquarium you’re gonna have/already have. Whether it’s a Freshwater aquarium, a planted aquarium, an aquarium with monster fish, Goldfish or a Turtle Tank this is especially important for the next criteria which are the bioload and types of waste and byproducts that will be produced. Bioload is the amount of waste that is going to be produced in your aquarium by the organisms, and other cycles that simultaneously work in your aquarium (eg. Nitrogen Cycle). Goldfish, turtles etc. Have a high bioload and it’s always best to have a filter that can counter this amount of waste. Filtration efficiency, flow rate and durability of the filter should be taken into consideration. Filtration efficiency is often calculated in GPH (Gallons per hour) it is the number of gallons of water that is turned over in an hour. Ideally, your tank should have ’10 times’ the filtration per gallon of water. So for example, if you have a 20-gallon tank, your filter should provide you with 200 GPH. 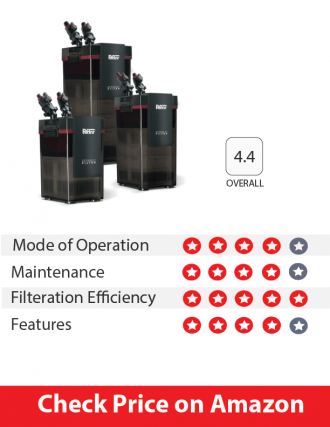 From the above list of best canister filters, each of them is highly efficient when it comes to filtration efficiency. Tank size is an important factor is the size of the aquarium. Most large saltwater or reef tanks would be better off with a sump, but you can also do with good filtration systems mentioned here. Doesn’t hurt if you buy a filter, one size greater than the capacity of your tank because of more the merrier. Last but not the least, the cost is also a factor for choosing a canister filter. In our list of best canister filters, you can find canister filters from a wider variety of budgets. More the budget, more the features you could expect. In our experience, a canister filter with very basic features would also do a great job. But a canister filter with added features would be convenient to use. So we’ve reviewed the best canister filters for you, remember the filter is the heart of the aquarium and pick yours well. The best picks are in front of you and so are the other contenders that you can choose based on your requirements, budget etc. What are the advantages of using a canister filter? I recently upgraded from 30 Gal to 55 Gal, and was advised to switch to a Canister filter. I am currently using a bio-wheel filter and wondering if using a canister filter would be of any advantage. You can hide the canister filter from the sight. Most of the canister filters are so quiet that you would not notice it running. aquariumguide.net is a participant in the Amazon Services LLC Associates Program, an affiliate advertising program designed to provide a means for sites to earn advertising fees by advertising and linking to amazon.com Amazon Service LLC Associates Program.